We pride ourselves in maintaining the warm and friendly atmosphere that has been part of Honeycombe House over many years. 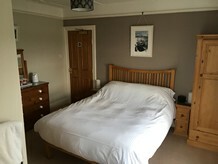 All our rooms have Double glazed windows and central heating controlled via a thermostat on the radiator, and include a heated towel rail, flat screen T.V. 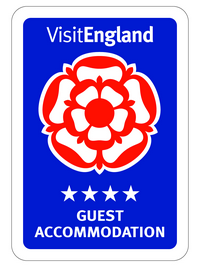 Tea/Coffee making facilities, toiletries and also a hairdryer and clock radio. 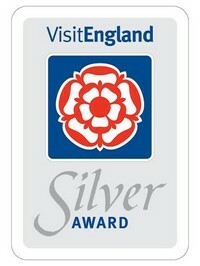 Wi- Fi Internet access is available throughout the guest areas of the house. Sterilized, Dust mite and Allergen Free, Fungal Spores and other debris removed and Germs and Bacteria destroyed. 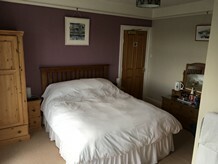 Double room with king size bed, en-suite shower, W.C. and hand washbasin. 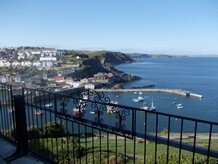 Door leading to a large balcony with seating with a stunning 180-degree panoramic view, which encompasses both inner and outer harbours, green rolling countryside, the village of Mevagissey, and the rugged coastline of St. Austell Bay. 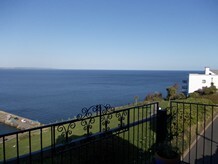 The sea view from the bedroom window takes in Mevagissey Bay as far as the horizon. The view from the bedroom window is a bird’s eye view of the harbour. 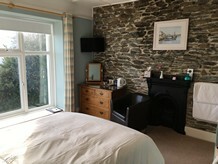 Double room with king size bed, en-suite shower, W.C. and hand washbasin plus feature fireplace and exposed stonewall. 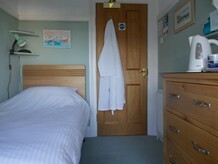 Twin/Double room with en-suite shower, W.C. and hand washbasin. 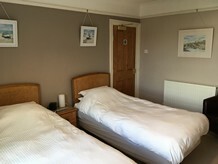 The two single beds in this room can zip and link together to make a super king size width Double bed if required. Views across the village, valley and as far as Heligan House nestled in the trees amongst The Lost Gardens of Heligan. There is also a clear view of the inner harbour through the bedroom window. Single room with a hand washbasin in the room and a separate private shower and private W.C. located on the same landing for the exclusive use of this room. Copyright © 2014 Honeycombe House. Design Grrr8-Ideas All rights reserved.